There is no secret to this mortgage. If you think No Frills Mortgage, you think basic. The No Frills Mortgage is a home loan that provides the very least when it comes to flexibility, prepayment options, and term availability. 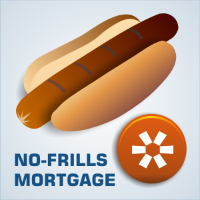 The No Frills mortgage has one main attraction: it has the lowest rate possible. This type of mortgage product is only available through a select few companies and to only a select few mortgage brokers. Many Canadian consumers are not interested in a No Frills Mortgage because of its lack of flexibility. The ones that do want this mortgage though will most likely not make a change for 5 years, don't plan on making any large pre-payments during the life of the term, and will not need to refinance or break the mortgage early. A No Frills Mortgage, for the most part, would not allow them to do this. DID YOU KNOW: This kind of wholesale product is only available to a select few brokers. Many other products offered by other brokers are introductory rates that do not last. Our no frills mortgage is not an introductory rate, it's just a really really low rate. The No Frills Mortgage provides a rock bottom wholesale rate with security over a fixed term. There is a payment increase allowance, typically 10 per cent of the mortgage payment amount and this is about the most important aspect of the No Frills Mortgage that is offered. Lenders have extensively surveyed Canadians' needs, and when it came to the need for a basic mortgage it became clear that many Canadians would not require anything more than the 5 year fixed, No Frills Mortgage product. The No Frills Mortgage has been met with much interest and excitement and our licensed Mortgage brokers have been able to provide very competitive rates and products in this category. If you think the No Frills Mortgage is right for you, contact a Mortgage Broker today. If you are not quite certain if it is indeed the right fit, contact us and we will help determine if it makes sense for you. Not flexible; lacks a lot of features found in other 5-year mortgages, like large prepayments.